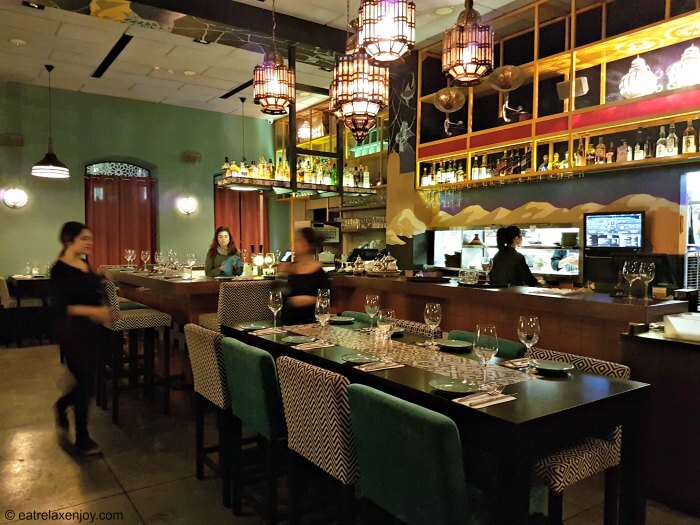 Ewa Safi is a Moroccan Restaurant located in Tel Aviv. If you are already in the Middle East – why not spend an evening in "Morocco"? The moment you enter Ewa Safi, you’ll feel like in Morocco. The décor is Moroccan style – full with colors of green, red and yellow. The tables' centers have typical mosaic pattern, Moroccan chandeliers, ceramics plates, and Moroccan music. 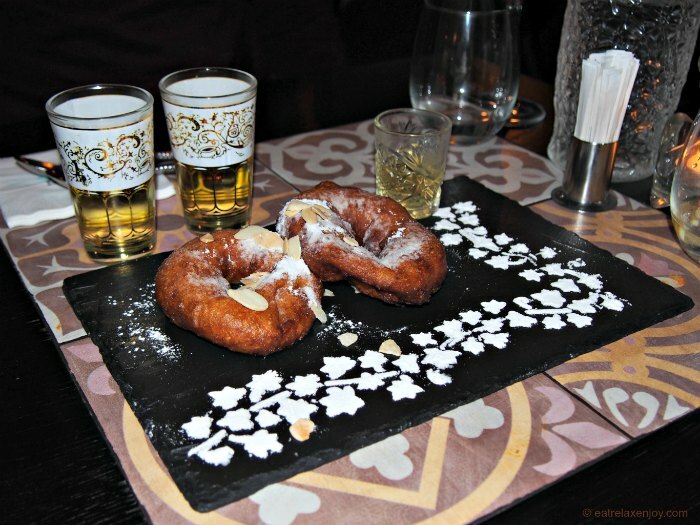 The restaurant serves updated traditional food. 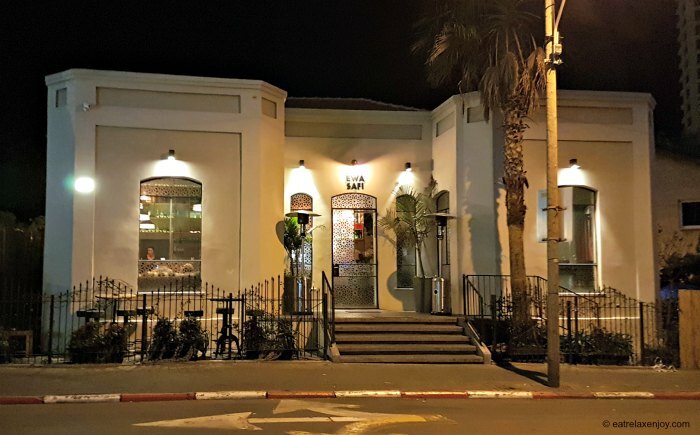 Ewa Safi is located in the Neve Tzedek neighborhood, the oldest part of Tel Aviv, and perhaps the most beautiful one. The house of Ewa Safi has been declared for preservation and is a charming one. We arrived at Ewa Safi on a weekday evening at 7PM. The crowd in the restaurant was mostly families, and Moroccan music was playing in the background. A little after 8PM, the restaurant was packed with a lively mature crowd. The atmosphere got warmer and the music louder – after a few glasses of wine and other spirits (there’s a wide alcohol and cocktails menu) – you’ll also want to get up and dance! A plate of the house salads that is served with warm soft Moroccan Frana bread: traditional beetroot, Moroccan carrot, eggplant dip, roasted peppers (with a lot of garlic), and spicy cherry tomatoes salad. We added also Matbucha, a cooked tomatoes and peppers dish, as no visit to Morocco is whole without that traditional dish! 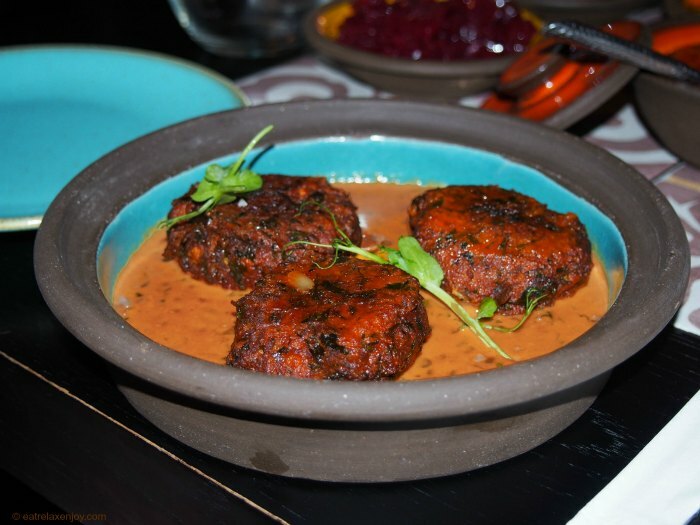 Everything is served here in colorful Moroccan-style clay dishes – forget about white plates :-). 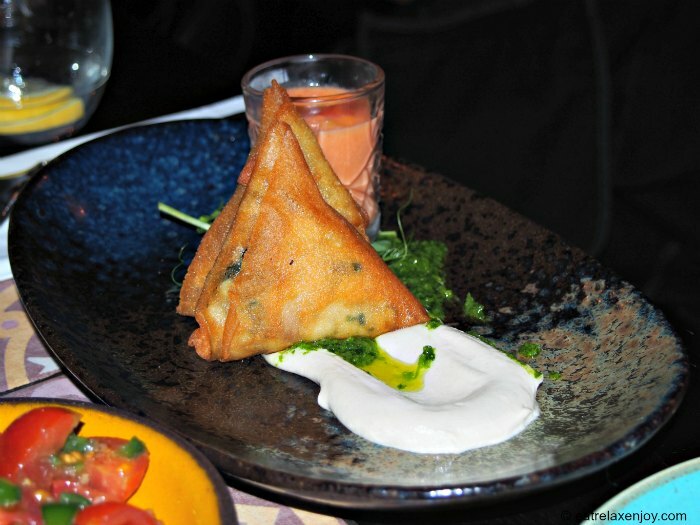 This set of starters is ideal for sharing. We especially liked the eggplant dip and the roasted peppers. Two pastels stuffed with a mix of salmon, sea bream, and channel bass, served with Gazpacho on Tahini and herbs pesto. A beautiful plate with the fish combination is genius. The sea bream and the bass moderate the dominant taste of the Salmon and gives it an interesting yet refined flavor. The Tahini and pesto are excellent dips for the pastels, and the Gazpacho is a wonderful bonus! Three juicy fat vegetable patties swimming in a warm salsa with lentils – very tasty. The main courses we picked were chicken thighs and beef Tajine. 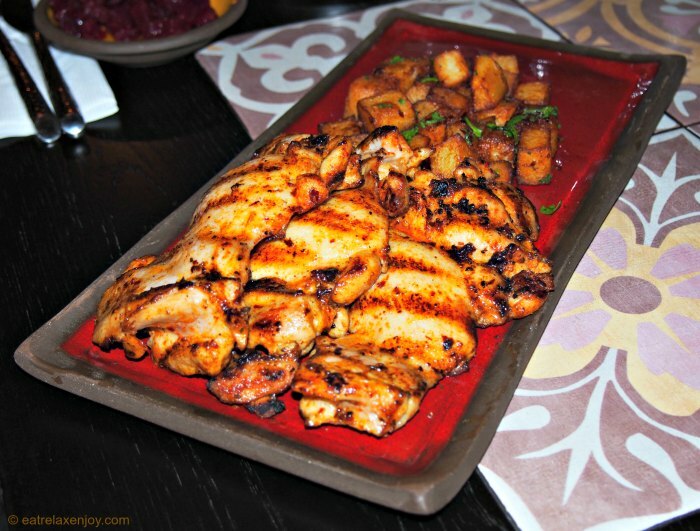 An especially generous portion of 3 marinated and grilled chicken thighs. The chicken was not spicy, yet very well seasoned, very soft yet crunchy in the stripes from the grilling. The Moroccan fries were crisp and spicy. My partner had this dish and said it was a pleasure! This Tajine is a beef stew with vegetables (zucchini, carrot, and potato, with chickpeas) in herbs and red sauce, served on couscous in a traditional Tajine ceramics pot. Tajine is a traditional casserole cooked in a special pot in the shape of a cone that contains beef, chicken, or fish made with vegetables or fruits. The cone shape maintains the humid in the pot and facilitates cooking without adding much water. Tajine is one of the typical Moroccan food, together with the salads and Matbucha. At Ewa Safi, this plate is served on a personal ceramics Tajine. Considering this, if you get there, order Tajine, not just any grilled meat – you came here for the Moroccan experience, didn’t you?!?! 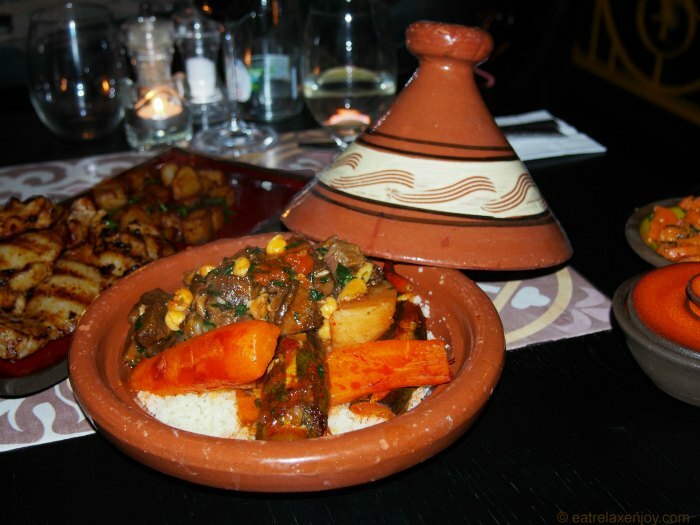 And the second reason why you should order Tajine is because it is so yummy! The meat is exceptionally soft, the vegetables are divine and the couscous is the best one I ever had. A pleasure at every bite! For dessert, there are Moroccan cookies with sweet tea. There is also coffee and specials, so ask the waiter for more information. We had Spinge doughnuts. The restaurant menu is not big but diverse enough; it is clearly highlighted for dishes that include gluten, vegetarian, and the spiciness level (one chili – mildly spiced, two chili peppers – very spicy). Ewa Safi excels in the freshness and the quality of its ingredients, which is evident in all the dishes. Shimon Barak, one of the owners, took me to see the “behind the scenes”, where I saw high quality red greenhouse tomatoes on their stem, flawless zucchini, and yellow bright lemon – all of the best quality. A pile of not so perfect vegetables was placed near the door – for return. Ewa Safi only uses the best vegetables and fresh meat brought daily and it is evident in the looks and taste of the food. 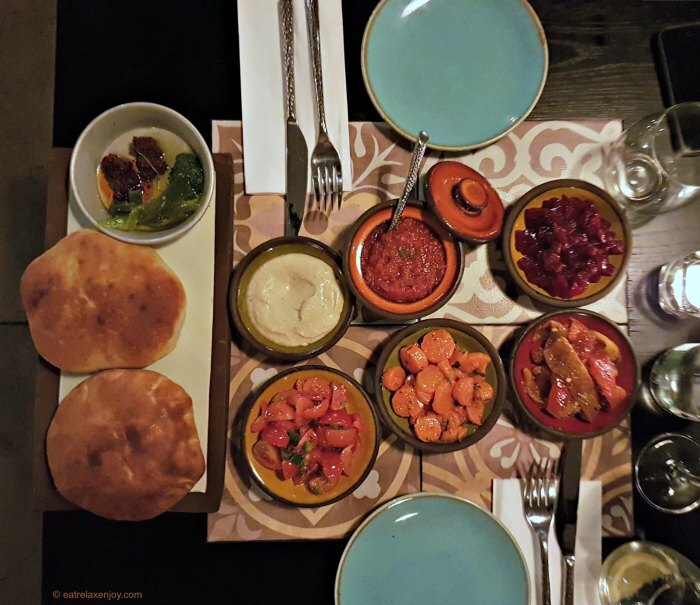 In summary, Ewa Safi is one of the best restaurants I ate in lately – the atmosphere, the food, and the excellent service. 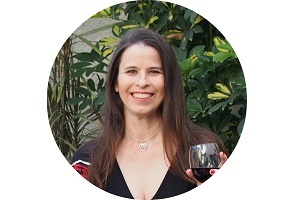 I warmly recommend going there – and make sure you make reservations as it fills quickly!